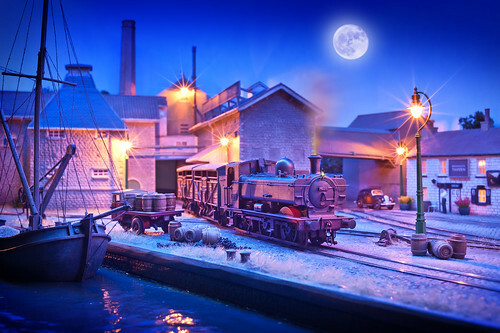 Chris Nevard Model Railways Blog: Brew Moon! nevard_120719_DSC_7298moon, a photo by nevardmedia on Flickr. Here's a real chocolate box one (alcohol filled ones I think) of Brewhouse Quay after dark. I'm messing about with some cool LEDs as part of a feature I'm writing on lighting a layout to portray night time scenes. To the naked eye they look like moonlight, but the camera when set to a 30 second exposure records them like the below when I shoot in a totally blackened out room! This is a good example of how a camera can sometimes distort things. If I desaturate the image I'm sure I could match what the naked eye sees - but I quite like the effect! The moon and smoke is the only computer farty stuff, but it's given me an idea to project a moon onto the 14 inch high backscene maybe - if I can work out how! The moon by the way was that 'supermoon' of a year or two ago. Something to think about, I think the blue of the dusk is too blue. Compared to the yellow of the tungsten s/lamps, there shouldn't be that much of a difference between the two. Try warming up the blue (or desaturating it) in PS to see how it looks.